There were 15 shooting deaths by police of unarmed black men in the United States in 2018, according to official data compiled by The Washington Post. These figures come despite pervasive, yet misplaced, public outcry that has characterized police shootings of blacks as pathologically widespread and the most critical issue facing the black community. Year after year, the statistics don’t support that narrative, and 2018 was no exception. 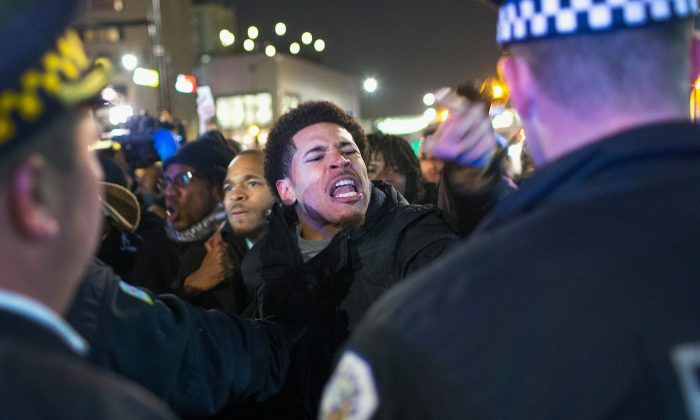 The political left in America incessantly characterizes the police and the country itself as racist, in part based on the occurrence of police shootings, even with the statistically paltry numbers of officer-involved shooting deaths. And while they routinely rile their base by mischaracterizing police shooting data as they engage in demagoguery of political opposition, they ignore a real crisis within the black community—the thousands of blacks who are shot every year by non-police. Let’s discuss the real tragedy of last year. The Baltimore Sun reported that 217 blacks were killed in Baltimore in shooting deaths, while The Los Angeles Times said that 124 black victims were shot and killed in Los Angeles in 2018, and the Chicago Tribune reported 279 blacks were shot to death last year. In three of the largest cities in the country, 620 blacks were slaughtered with no outcry from leftist media pundits. There were no candlelight vigils or marches, no outrage from celebrity athletes or prominent leftist black leaders, and certainly no attention from the Democrats who control policymaking in those cities. It’s precisely this lack of attention to the biggest problem concerning violence in black communities that leads many to suspect that, for Democrats, black lives don’t really matter, just black votes. “The vogue commentary of the liberal left in the 21st century is to drone on about the many failures of the white devils. Those evil white supremacists who are invariably described as conservative Republicans,” Tamara Enalls-Fenner, author of “How the Democrats Destroyed the Black Community … and No One Noticed” told me in an interview. Enalls-Fenner is an activist who co-authored the white paper Reforming the Violent Crime Control and Law Enforcement Act of 1994 (The Crime Bill): A Rebuilding of the Criminal Justice System. She couldn’t be more correct. Data from the Federal Bureau of Investigation showed that in 2017, there were 2,627 murders of blacks by other blacks in the United States. For perspective, consider that this nearly equates to the number of the lives lost in the Sept. 11, 2001, attacks. And this is happening annually within our communities. Such an honest examination of the data isn’t meant to excuse legitimate cases of police brutality. In such cases, the officers involved should be (and often are) charged and convicted. Take, for instance, the case of Walter Scott, a South Carolina resident who was shot eight times in the back by police officer Michael Slager. Slager was charged with murder, convicted, and was sentenced to 20 years in prison. A more recent example would be the case of officer Amber Guyger, a white police officer in Dallas, who was charged with murder after she allegedly shot and killed her black neighbor Botham Jean in his apartment. As of the time of writing, Guyger is awaiting trial and faces a possible sentence of life in prison. Also, in 2018, white police officer Jason Van Dyke was convicted of second-degree murder in the shooting death of black teen Laquan McDonald, who was shot 16 times. Police shootings of this nature are the exception, not the norm. However, sweeping coverage from leftist news organizations would have you believe otherwise. Additionally, the above examples illustrate that in clear-cut cases of wrongdoing, officers do face severe punishment. Yet, even if each of the 15 shootings of unarmed black men resulted in the conviction of a police officer, it pales in comparison to the violent deaths we inflict upon ourselves. Just 0.01 percent of the murders of blacks in the United States are from officer-involved shootings. To state this more clearly, 99.99 percent of murders of blacks in the United States are non-police related. This is the real epidemic. America’s black communities certainly have a problem with shootings. But the police aren’t the ones pulling most of the triggers. Adrian Norman is a writer and political commentator.